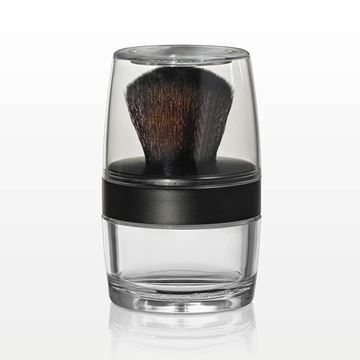 This nylon hair kabuki brush with matte black base screws on to a 20 gram clear jar (Part # 10057) which is ideal for packaging loose powder formulations. The clear overcap comes with a convenient small mirror on top. Purchase the corresponding sifter (Part # 10056) to help reduce product waste. Fully assembled jar and cap measures 1.85 inch Diameter x 2.84 inch (47 mm x 72 mm).